My father is quite the amazing man. Life for Bart Pierce used to mean huffing a pack and a half of Merit Lights (the signature golden wrapper is as burned into my childhood memories as the smokes themselves) a day and knocking back tumbler after tumbler of caramel-colored, crooning, captivating Early Times. Exercise was a verb better saved for the lithe men and women about town; those who didn’t have jobs that encompassed fifty, sixty, seventy hours in a given week. Those who simply were healthy from the get-go. My father, in his mind, was too old to exercise, in too deep a hole of inertia to change his life. And one day, over eight years ago now, he threw up his hands. He had had enough. On 16 June 2008, my father took his last sip of the wicked whiskey that controlled his world. Slowly, the world around him began to turn more beautiful; hues were more vibrant and smells more fragrant when he was no longer a prisoner to alcohol’s chaining grasp. Fast forward to the spring of 2012. I had just enlisted in the US Coast Guard and incorporated exercise into my daily life, which was a foreign concept to me. I was raised by couch potatoes in Alabama whose idea of an active lifestyle was 30 minutes on an elliptical once a week. I fell in love with running at this time in my own life; I craved the surge of endorphins and the feeling of raw power that comes from the sheer act of propelling the body forward, the feeling that the body is used for more than simply existing but also moving and traversing and thriving. I couldn’t keep this secret all to myself. I did some more haggling with my father until finally he gave in to my stubbornness and walked into Planet Fitness just to appease me. The act of simply shutting me up changed his life forever. I told him to stick with it. He couldn’t expect to drown his body with whiskey and light it on fire with cigarettes for most of his life then hop on a treadmill and feel just dandy. I told him that his lightheadedness, his disorientation, all his sick-feeling symptoms were all proof that he was making a difference in his body. And yet, that day, something changed in him. He was able to see runners of all shapes, sizes, and ages crossing that illustrious finish line. As soon as he returned home to Alabama, he got fitted for a pair of Mizunos and ran his first mile. That first mile, he said, was the hardest he’s ever worked in his life; a constant stop-and-start production of his nicotine-nuanced lungs working against him. And yet, he continued along. And the next day, he ran again. He ran every day, following a Hal Higdon Half training program that I recommended, until running shifted in his mind from an agonizing chore to a delightful hobby. On 13 January 2013, my father finished The First Light Half Marathon in a swirl of passion and a shield of unseen belief that yes, anything worth the work really is possible. He was fifty-three years old and had been running for less than four months. My father joined Instagram. It seemed like the hip thing to do, and a way to keep up with me and his two other adult daughters spread out across the country. He decided to share his runs because, hey, why not? They were a huge part of his life while battling empty nest syndrome and he figured that he could connect with a few like-minded people. Slowly, he began to gain popularity as this old guy who was running. It seemed like a novel concept: a man who was closer on the spectrum of life events to receiving Social Security than having a kid or finding a new job was picking up a new hobby; and it was distance running, of all things. 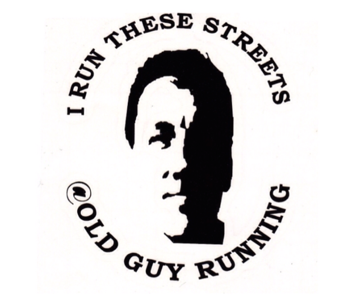 @oldguyrunning was beginning to influence others, young and old, fat and skinny, running newbie or distance pro with his optimism, his perseverance, and his unfailing will to just keep putting one foot in front of the other, day after day. As his Instagram following grew, my dad created a running community called Challengeville that, at first, was just for him. He created “challenges” to acclimate himself to distance running; monthly plans to elevate his running ability. Slowly, as he posted more and more about his challenges via Instagram, his followers wanted in on Challengeville. Every month, more and more challengers began to sign up for one of the four challenges, pushing my father to create two more challenges to better cater to different running abilities. The way a challenge works is simple: a challenger simply signs up via a link on the Challengeville website, and follows the training plan. Every day, he or she posts their runs using the hashtag #challengeville as well as the name of the challenge (for example, a person running the Bigfoot Challenge would use #oldguyrunningbigfoot). Through Challengeville, my dad has been able to inspire and transform many sedentary people not only in the United States, but all over the world! He has followers as far as Singapore and The Netherlands ‘repping Challengeville. 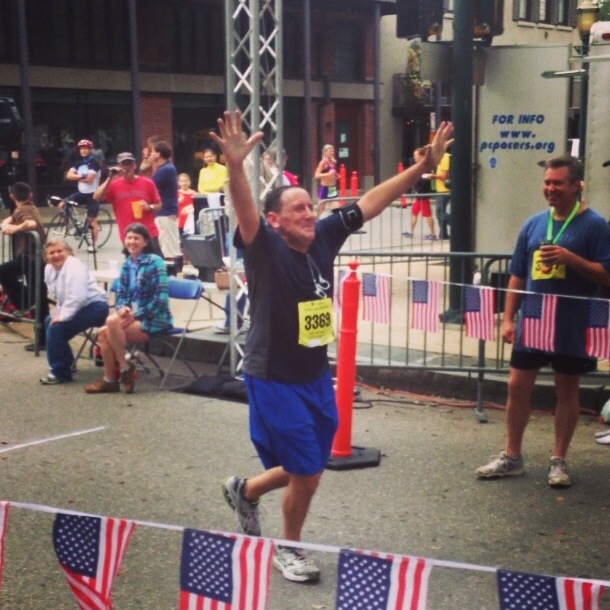 In November 2013, my father took on his largest challenge yet: an entire month of charity running. My father’s employer, Arby’s Incorporated, sponsored him as he partnered with the No Kid Hungry Foundation to help needy families in the area. My father’s pledge was easy: he would run 300 miles in a month. Others would donate what they could. During this month, my dad ran his first full marathon, raised over $1000 for the No Kid Hungry Foundation, and learned just how powerful a person can be when the drive for excellence is present. Gone were the days of excuses, the days of “I’m too old, I’m not made for that.” Bart Pierce established himself as a powerhouse. In the months since that inspiring 300 Mile November, my father has returned to the scene of the crime and run the First Light Full Marathon after falling in love with distance running there just a year prior. Challengeville is flourishing and prospering; my dad sees hundreds of runners signing up each month to take on one of his challenges and be healthier, happier versions of themselves. These days, he’s had to take some off running due to a new promotion and heavier workload, but he’s looking to get back out on the streets and explore his new town soon. He has future plans of running another charity month for The Home of Grace in Mobile, Alabama to support the healthy treatment and rehabilitation of drug and alcohol addiction. I love this and everything about it. He truly fits, “When there’s a will, there’s a way!” Truly inspirational!